Yesterday I ran the NYC Half Marathon (in a time that qualified me for the NYC Marathon–yes!). One of the things I noticed along the route was the presence of live musicians and DJs playing music every few miles or so. 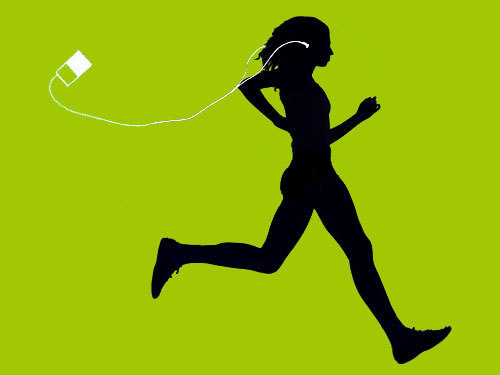 I’ve never run with portable music players, because I’ve never bothered trying and because the sound of the music “shaking” with my body movement doesn’t sound right to me. Maybe talk radio would work, but wobbling music? No thanks. There were also lone musicians along the course, all of them men with acoustic guitars, most of them seeming a little “off” in one way or another. Their enthusiastic strumming didn’t carry very far in the open air, and none of them seemed to be playing anything recognizable as music anyway—they just strummed away. But like the sound from the cowbell folks, the strumming came across as welcome enthusiasm, as if to signify: “I don’t know why you’re running, but I shall play my guitar in solidarity with your effort.” As strange as it was, I appreciated the strumming. Interestingly and shockingly to me, I ran in sync to both Skynyrd and Biggie. As soon as I heard their respective songs, I instinctively locked into the tempo by adjusted my gait a little—my stride rate becoming quicker for Skynyrd and then slower for Biggie. I was happy too, because for those brief moments I was perfectly distracted from the physical task at hand, my attention pleasurably consumed by the experience of being physically in sync with songs with which I’m casually well acquainted. It was fun, through the thought (not to mention the sight!) of me smiling while running in sync to Lynyrd Skynyrd is still really disturbing. What I was experiencing for those brief blissful moments could be called a kind of entrainment, the experience of a person syncing to an external pulse, usually one produced by others with whom one is interacting socially. You could say we do this in a mild way when we tap our feet to music, and in a more intense way when the music compels us to dance (or run) in time to it. Taken to its extreme, entrainment can set the stage for altered states of consciousness such as possession–the rhythm of an external stimulus prompting us to groove with it and ultimately enter into some kind of transcendent state. The music on the course—yes, even the Skynyrd–probably didn’t put anyone into a trance but was nevertheless my strange mechanism, energizing me because it provided a stimulus that was at once a kind of aural clock and something to focus on, giving structure and helping me make sense of a few minutes here and there as I was consumed by listening. Without music, I tend to search for sounding things to focus on anyway—things like the sound of my breathing or the regular rhythmic “swish” of my arms moving under my jacket. If you pay attention, there’s always something there to either focus on or sync to. After the race, in the midst of the cheering crowd and the booming music that echoed off the buildings around South Street Seaport, I thought about two possibilities for designing a race day soundscape. The first would be a completely silent race. There were brief moments of this as we ran through Central Park where the crowd was sparse and all you could hear was the sound of feet hitting the pavement. We sounded like a herd of buffalo, and because all you could hear was feet, as a runner it felt like being in a herd too—the sensation of being swept along in an animal wave. But okay, I agree with you, a silent race would be a real downer of a race in a place like NYC. So, the second soundscape possibility would be to wire the course with one huge set of connected speakers playing a single piece of music for several hours. But I leave you with questions: What would this music be? Would it be highly rhythmic, like an extended DJ set? And would its tempo correspond to the supposedly ideal running pace of 180 strides per minute, with songs clocking in fast at 180 BPM or with a half-time feel of 90 BPM? Most importantly, what would be experience of running to such an extended soundtrack feel like? Below are those three songs I heard on the course. It’s a DJ “set” that could probably never happen anywhere else! Hi Don – I’m glad you found this blog post and thanks for playing that music on the course!